We dropped in to INabstracto a few days ago to chat with owner Kate Eisen, and it was only when we were leaving that we noticed the delicious still-life she had made from grouping five Lotte lamps together on a shelf. The photograph more or less took itself. But we didn’t know what Lotte lamps actually were until Kate filled us in. As it turns out, the name Lotte lamps—or just Lotte’s, as they are so frequently called—refers to the heavy stoneware lamps (with fiberglass shades) first produced in 1956 by the Bostlund family of Copenhagen. Gunnar Bostlund had trained at the Technical University of Denmark as a ceramic engineer. His wife, Lotte, had studied arts and crafts. Many of their lamps were hand-painted and signed by Lotte herself. The Bostlunds had six children, and they all participated in the making of the family’s lamps, whether they were glazing, wiring or fabricating the hard-to-make shades. By 1962, the Bostlunds’ lamps were being sold at Georg Jensen in New York and also at the Georg Jensen store on Bloor Street here in Toronto. Lotte’s lamps are now highly collectible. 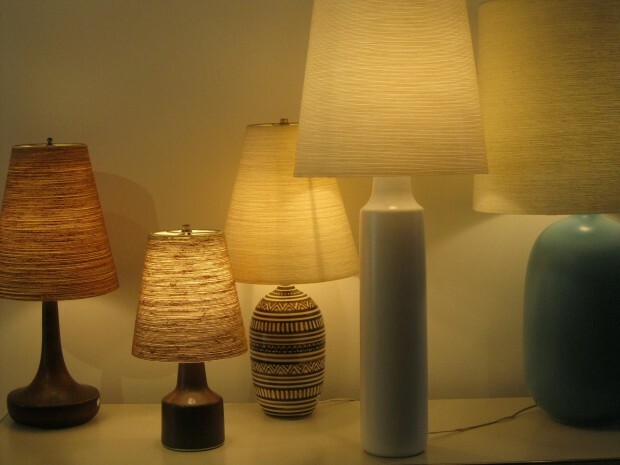 The prices of the lamps in the photograph, reading from left to right, are $375 (medium size brown), $250 (small brown), $380 (tribal pattern), $650 (large white) and $750 (robin’s egg blue).